Thomas Jefferson…it was said that he held dinners by candle light where leaders from near and far gathered to connect and discuss important issues of the day. History tells us that the ideas and insights coming out of these dinners influenced the creation of our country. Fast forward to today; individuals and organizations across the world are replicating the Jeffersonian Dinner model to make important connections and to participate in meaningful dialogue about issues they care about. The unique angle of Jefferson’s historic dinner model is that guests must engage in one conversation. The typical side conversations that go on during traditional dinner parties are not allowed. When a guest speaks they address the whole table, and the whole table listens. When a small group of diverse individuals engage in one conversation you generate better ideas because they are informed by a variety of perspectives and insights. It makes for a more comprehensive, holistic dialogue. Add delicious food to the equation and you have a winning formula! Why Jefferson’s approach for LSC? During their class project work focused on LSC alumni engagement strategies, a small group of class members learned that other leadership programs across the country, including our friends over at Leadership Rhode Island, hold similar dinners with their alumni with much success. We were compelled to replicate this very cool concept here at LSC too. 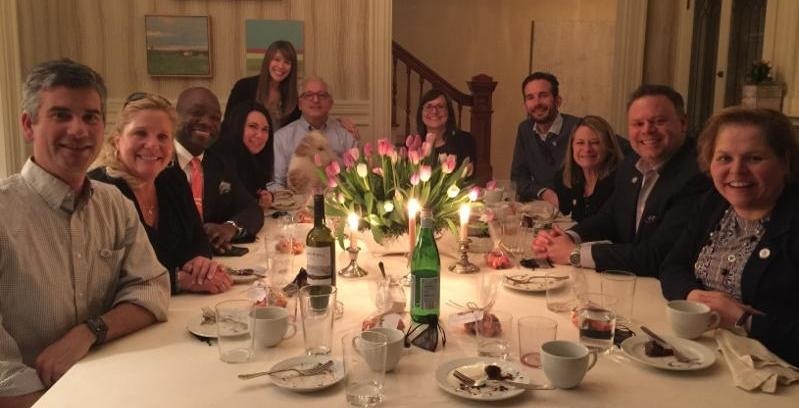 We kicked-off our new dinner series, loosely called “Dinner for 12,” on Wednesday at the home of John Vasconcellos (LSC ’05) of the Community Foundation of Southeastern MA. Wednesday night’s gathering was the first of four dinners LSC will be organizing in 2018 focused on the topic of “LSC Alumni Engagement and Collaboration.” Each dinner will be hosted by an LSC graduate and will include a new set of 12 alumni to contribute to the conversation and generate new insights. We’d like these dinners to become a regular addition to LSC’s alumni engagement activities and hope that in time, alumni will embrace them as a valuable way to engage in purposeful conversation around issues they care about. Interested in hosting or attending one of our dinners? Contact Jennifer Downing. Dinner guests from left: Andy Herlihy (’14) of Community Boating Center, Michelle Lorganger (’11) of Children’s Advocacy Center of Bristol County, Dr. Anthony Baird (’13) of UMass Dartmouth Charlton College of Business, Lindsey Savageau (’15) of Justice Resource Institute, Jennifer Downing (’09) of LSC and the evening’s moderator, John Vasconcellos (’05) of the Community Foundation of Southeastern MA and our host, Sarah Athanas (’17) of Groundwork!, Marc Bellanger (’15) of Merkle Inc., Jennifer Menard (’06) of Bristol Community College, Stephen Mitchell (’12) of Morgan Stanley, and Joan Medeiros (’05) of Bristol County Savings Bank. Not pictured is Jennifer DeBarros (’14). next post: Join LSC and Groundwork for Business After Hours May 17!